Enjoy everything California’s Beach City has to offer including the San Diego Bay Wine + Food Festival and these top things to do. 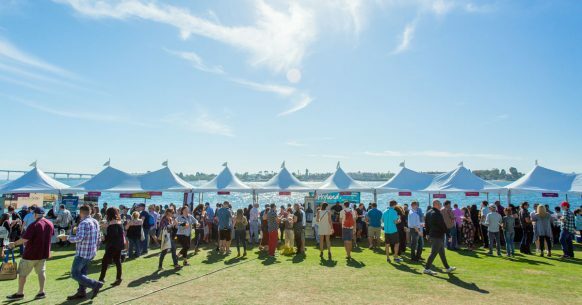 Now in its 15th year, the San Diego Bay Wine + Food Festival® is the largest wine and culinary classic on the West Coast and is a signature event for the city of San Diego. The week long festival features wine tasting seminars, cooking classes by James Beard Award-winning chefs, intimate luncheons with hand-selected wine pairings, and unforgettable celebrity chef dinners. The Festival culminates on Saturday at the star-studded Grand Tasting Event held on the magnificent San Diego Bay. A once-in-a-lifetime opportunity is coming to the San Diego Air & Space Museum in November! The owner of the Bullitt car, Sean Kiernan, is loaning his Highland Green 1968 Ford Mustang GT fastback to the SPEED: Science in Motion exhibit! This is huge and a great Grand Finale for the SPEED exhibit! Secret Society of Adultologists is a 21+ event that lets museum guest stay after hours and rediscover their sense of wonder through science, art, hands-on activities, and more! In celebration of our newest exhibition, Hidden Gems, the theme is Shiny Pretty Things. Our Museum scientists will share treasures from our collection of more than 9 million specimens. The event will also include a live music, a drag queen performance, access to a rooftop bar and more. Welcome to the Outdoor Rink at ARTS DISTRICT Liberty Station! Want to experience skating ice skating in the heart of America’s Finest City all while benefiting a great cause? Come to ARTS DISTRICT Liberty Station and join us in a benefit for the Peckham Center for Cancer and Blood Disorders at Rady Children’s Hospital-San Diego. This entry was posted in San Diego Events, Top Things to Do and tagged county, enterainment by Brent Bernasconi. Bookmark the permalink.